Our new website is up and running. It's still primative but I'm working on learning how to slowly make it better. Check in on it from time to time to see what's been added. The webstore isn't up & running. I have no idea when it will be. We'll keep you posted on this big developments. Our newsletter will look even better next time. 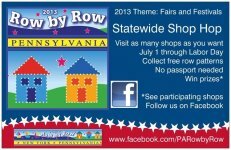 The PA/NY Row by Row Shop Hop started yesterday and will continue to Sept. 2, 2013. Come in today to get your free Row Pattern. We also have fabric "license plates" available for purchase to help you remember where you picked up your pattern. I thought it would be a great idea to put the "license plates" on the back of your quilt so you would have a nice souvnier & reminder where your rows came from. Your FCP is due by Friday, July 5th. We will start the voting on July 5th, so be sure to get it in on time so you don't miss out on any votes! The winners of our Fabric Challenge will be determined by you, our customers. We have extended the vote time to Saturday, July 20, 2013. Votes will be tallied on Monday, July 22, 2013. Winners will be announced on Wednesday, July 24, 2013. The Fabric Challenge this month is Christmas in July. We received our first Challenger's Project yesterday & it's beautiful. We can't wait to see what comes in. They're always beautiful & the creativy of our Challengers never ceases to amaze us. Mark you calendar for the week of July 22-27, 2013. It is truly Christmas in July. Everything (except handmade goods) is on SALE at 25% OFF! The first newsletter from our new website is finished. It's been a worthwhile struggle to get it up & running. We'll be able to offer more incentives as we get to know our way around the site. Keep you stiches straight & don't sweat the little mistakes. Every quilt has some mistakes in it, that's what makes them so great.